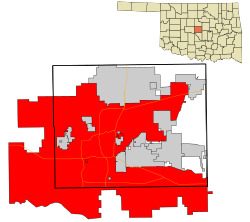 "OKC", "The 405", "The City", "The Big Friendly"
Location in Oklahoma County and the U.S. state of Oklahoma. Lua error in Module:Location_map at line 488: Unable to find the specified location map definition: "Module:Location map/data/USA Oklahoma" does not exist. 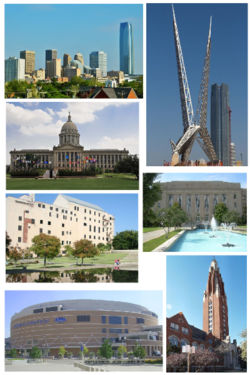 Oklahoma City is the capital city of the U.S. state of Oklahoma, and the largest city in the state. As of 2006, the population of the city was about 537,734. The Oklahoma City bombing happened in Oklahoma in 1995. Oklahoma City has an NBA team called the Oklahoma City Thunder. It is the county seat of Oklahoma County. ↑ NewsOK.com. Retrieved February 21, 2008. ↑ "'Big Friendly' moniker is beginning to stick". NewsOK.com. ↑ 4.0 4.1 "Oklahoma City". Oklahoma History Society. Archived from the original on April 12, 2016. Retrieved April 12, 2016. ↑ "American FactFinder". United States Census Bureau. Retrieved August 29, 2014. ↑ "American FactFinder". United States Census Bureau. Retrieved May 25, 2018. ↑ "Zip Code Lookup". USPS. Archived from the original on November 23, 2010. Retrieved December 11, 2008. This page was last changed on 21 June 2018, at 18:15.